Conference attendees were asked to vote on a logo design for certification. The design above was the clear winner, but its not yet final. We're still working on improving the design, as we believe it is still not quite right. FALDP joined the Florida Prosperity Partnership (FPP) as a corporate member after Lars Gilberts discussed the group during his conference presentation. The FPP offers a wealth of information and networking opportunities for our members, as we serve a similar demographic. The FPP is offering a webinar on Wednesday October 21 about the pitfalls and remedies for people who are caught up in the cycle of Pay Day Loans. And the FPP is also offering a series of Town Hall Meetings throughout the state. Please check their site for an event near you. The Town Hall meetings are free, but require advance registration. 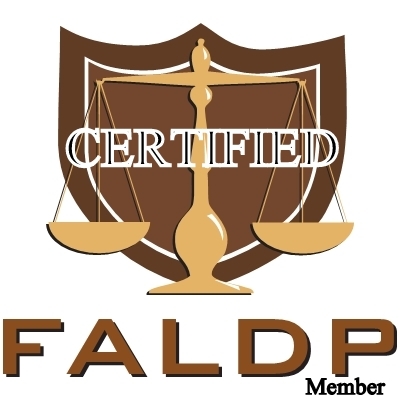 There is no cost to FALDP Certification at this time. Exams will be free and online. Study materials will be made available in October/ November. Exams will be available in February/ March. We are relaunching our site design site - Horizon Research Network - relaunch and invite you to take a look. It is still a work in progress, and we will be expanding the content and services very soon. If you do not have a website - we can help. In 2015, trying to run a business without a website is like trying to stay dry with no roof on your house. Let's build that roof! The Members' Circle Program is a rewards and recruiting program combined. Current members are invited to recruit document preparers to join us. For this effort you will be rewarded in two ways. First, for each new member you recruit, you'll receive one Continuing Education Unit (CEU) to be applied towards your certification. Second, when you recruit three members your next membership fee will be waived. You can find complete information about our new Members' Circle Program within the Members Only area on our site. The first three members who post an answer to one of the questions on the "Ask the Members" forum will receive one CEU to be applied toward certification. You can answer any of the questions, please remember to cite a source for your information. You may include your contact information along with providing a helpful answer. The first three members who post an answer to one of the questions on the "Member's Corner" forum will also receive one CEU. The questions have not been posted yet, but will be posted by the weekend. Thank you for your responses to my request for help in documenting the infringement of our FALDP logo. As of 10/14 he had not been served. Please let us know of any document preparer you believe may be using our logo without being a member.